Carnival Corporation & plc, the world’s leading cruise vacation company, today took delivery of Majestic Princess, from shipbuilder Fincantieri at an official handover ceremony at the shipyard in Monfalcone, Italy. 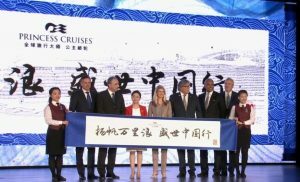 The cruise line’s first international luxury ship tailored for the China market, will start her inaugural season in Europe until May and then embark on a repositioning cruise themed the Silk Road Sea Route journey to her new homeport in Shanghai where she will begin her first homeport season in July. 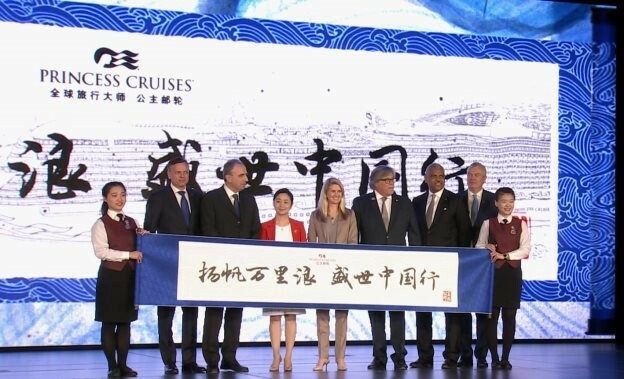 The ceremony was attended by the Italian Prime Minister, Paolo Gentiloni; executives from Carnival Corporation & plc including Micky Arison, Chairman; Arnold Donald, Chief Executive Officer; Stein Kruse, Chief Executive Officer of Holland America Group; Jan Swartz, Group President of Princess Cruises and Carnival Australia; Anthony Kaufman, Executive Vice President International Operations of Princess Cruises, and Cherry Wang, Vice President and General Manager of the Princess Cruises’ brand offices in China. Fincantieri was represented by Giuseppe Bono, Chief Executive Officer, and Giampiero Massolo, Chairman. “Majestic Princess has arrived and we are thrilled to add this new jewel to our crown representing the newest, most stylish and most luxurious flagship in fleet and ready to deliver an exceptional international cruise vacation experience to our guests,” said Jan Swartz Princess Cruises and Carnival Australia group president. After the successful handover from Fincantieri, Majestic Princess sets sail on a preview cruise (March 31 to April 4) that will include loyal Princess guests, international media, travel agent partners and brand partners from around the world, including many guests from China. Departing April 4, 2017, the 143,000-ton Majestic Princess will sail on her inaugural voyage, a five-day Adriatic Sea cruise roundtrip from Rome with stops in Kotor and Corfu. Following her maiden cruise, Majestic Princess will tour Europe, offering guests a chance to experience the ship on 7-, 14-, 21- and 28-day cruises departing from Rome, Barcelona or Athens. On May 21, Majestic Princess will embark on the “Silk Road Sea Route” a 49-day journey from Rome to Shanghai. During the voyage she will visit a total of 22 ports including Athens, Dubai, Cochin, Singapore, Port Klang and Xiamen before arriving in Shanghai, her new homeport in China. Majestic Princess will begin her first cruise from China on July 11 carrying 3,560 guests to a variety of cruise destinations.